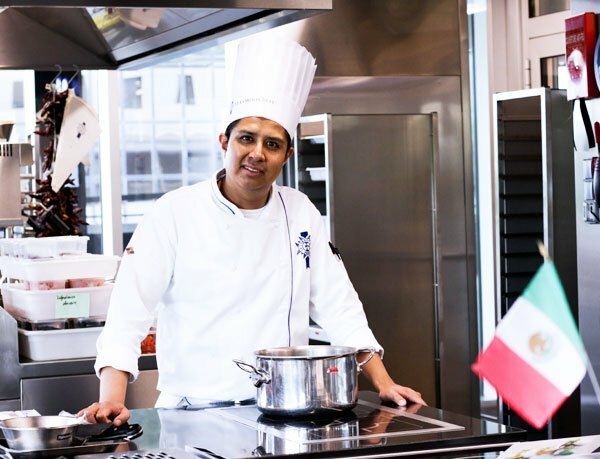 May 2018 – Mexican culinary culture is showcased at Le Cordon Bleu Paris institute with Chefs Aldo Omar Morales and Cédric Carême. Aldo Omar Morales is a Mexican cuisine Chef and Cedric Carême is technical director of Pastry and Boulangerie at Le Cordon Bleu Mexico. Students, representatives from the Mexican Embassy in France, journalists, and influential individuals were treated to a Mexican cuisine demonstration by Chefs Morales and Carême. The demonstration included a nopal cactus salad and milk rice, panna cotta, black sesame crumble, black beer ice cream, mango coulis. three milk cake with vanilla ice cream. For further information about Le Cordon Bleu Mexico (campus, training programmes, Chefs, etc), click here.